Michael Jordan was the hero the sports world not only wanted or needed, but desperately deserved and craved in March 1995. Major League Baseball was in the middle of a strike. The National Hockey League was having a lockout. The O.J. Simpson trial was in full swing. And the world was just beginning to get over the astonishment that Tonya Harding’s husband and bodyguard put out a hit on fellow ice skater Nancy Kerrigan to try to help Harding win the 1994 U.S. Figure Skating Championships. Jordan’s nearly 18-month sabbatical from basketball was done in a way that could only be imagined in the movies. It combined the right amount of coolness with just enough nonchalance. 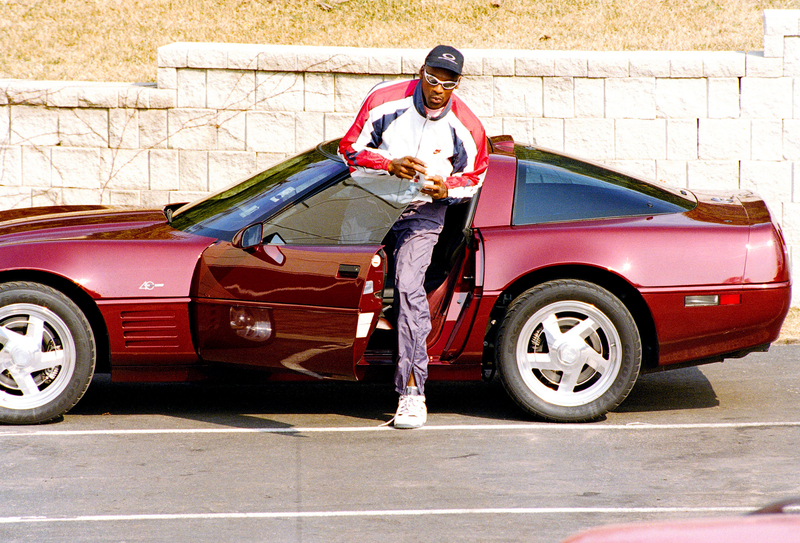 Michael Jordan arrives at the Chicago Bulls’ Berto training center on March 18, 1995, in Deerfield, Illinois. “I’m back,” Jordan said in a statement released by his agent, David Falk, confirming that Jordan’s first game back would be a nationally televised contest against the Indianapolis Pacers. And that was all that crisp piece of paper needed on it — those two words — to turn a run-of-the-mill Saturday into a day to rejoice. If there had been an internet, he would have broken it. His Airness left the game on top with three straight NBA titles and NBA Finals MVPs, three MVP awards, six All-Defensive team awards, seven first-team All-NBA selections and a record-tying seven straight scoring titles. Chicago was traveling to Indianapolis the very next day to play the Indiana Pacers, and in his return Jordan decided to play with the No. 45, which he played with in baseball, instead of his hallowed No. 23. Even though the Bulls were only three games above .500 when Jordan decided to come back to basketball, Las Vegas bettors decided the team now had 5-1 odds of winning the title instead of the 40-1 odds the team started out with before the announcement. 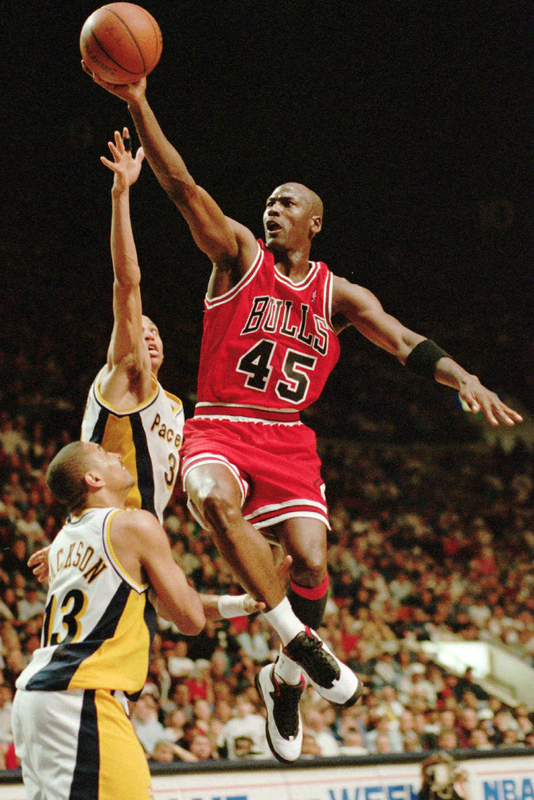 Chicago Bulls guard Michael Jordan flies to the hoop over the Indiana Pacers’ Reggie Miller and Mark Jackson (No. 13), March 19, 1995, in Indianapolis. “I hoped for it,” Jackson said to the Tribune. “I never thought it would be an actuality. Jordan’s return also sent seismic shockwaves through the Pacers’ public relations department, which had to process nearly 350 media requests in less than a day. Even though Pacers fans routinely booed Jordan during the starting player announcements, he received a standing ovation on this night. Rosterwise, Jordan returned to Scottie Pippen and B.J. Armstrong, but in the nearly two years since he last played with the team, center Bill Cartwright and forward Horace Grant had all departed. The new supporting cast included Steve Kerr, Toni Kukoc, Pete Myers and Bill Wennington. Rumors about Jordan’s return began after an innocuous video session and a pair of practices with the team. This created a Jordan watch in the U.S. and internationally. What made the possibility of Jordan returning even more enticing was that he was coming back to the game in his prime essentially — almost a month after his 32nd birthday.